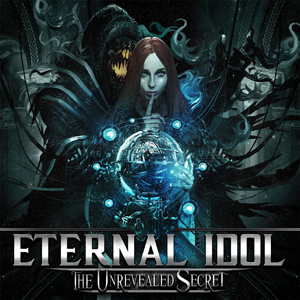 Frontiers Music Srl has announced the upcoming release of ETERNAL IDOL's debut album, entitled The Unrevealed Secret, on December 2nd. ETERNAL IDOL is a new band formed in early 2016 and that marks the start of a new musical adventure for RHAPSODY OF FIRE and ANGRA singer Fabio Lione, together with the experienced Italian guitar player Nick Savio (ex-HOLLOW HAZE) and a line-up completed by the young vocal rising star Giorgia Colleluori, Camillo Colleluori (both also from HOLLOW HAZE) on drums and Andrea Buratto (SECRET SPHERE, HELL IN THE CLUB) on bass. The album was recorded in the summer of 2016, produced by Nick Savio and mixed by Simone Mularoni (DGM, SUNSTORM) and promises to be one of the melodic metal releases of the year. Fans of KAMELOT, Magnus Karlsson's FREE FALL, MASTERPLAN and AVANTASIA should pay attention. “There is a story to be told with this album, and the secret will be revealed on the next ETERNAL IDOL releases, so please take your time to listen this first chapter and enjoy....A new story has begun,” Nick concludes. "Is The Answer Far From God?" "A Song In The Wind"